I love a good dinner party, especially the kind where the table is set with multiple layers of dishes that foretell of the evening’s coming delights. Collective anticipation grows when dish after dish is brought from the kitchen to the table. This type of evening is a treasure and it typically ends late when friends walk away with their body and soul fed. However, some gatherings should simply revolve around conversation and grazing. These evenings have their own enchantment of a relaxed atmosphere of food, wine and relationships. 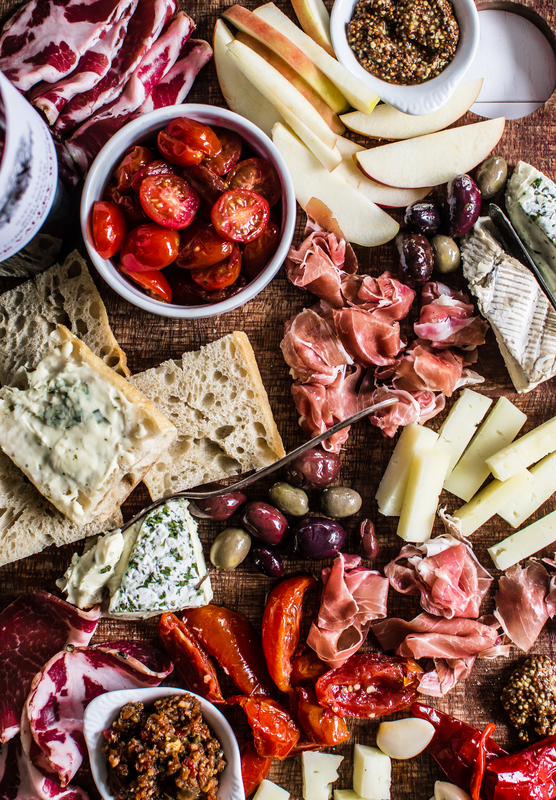 My approach to these types of get togethers almost always revolve around a few wooden boards filled with charcuterie, cheeses, apple slices, bread and smothered tomatoes. Putting together a board involves more prep time than cook time—but even still, it’s a simple and enjoyable task. Of course, the wine served on these evenings is critical. There aren’t revolving plates of food being brought to the dinner table where different pairings of dishes and wines are necessary. What’s being showcased is simple: meats, cheeses and produce. 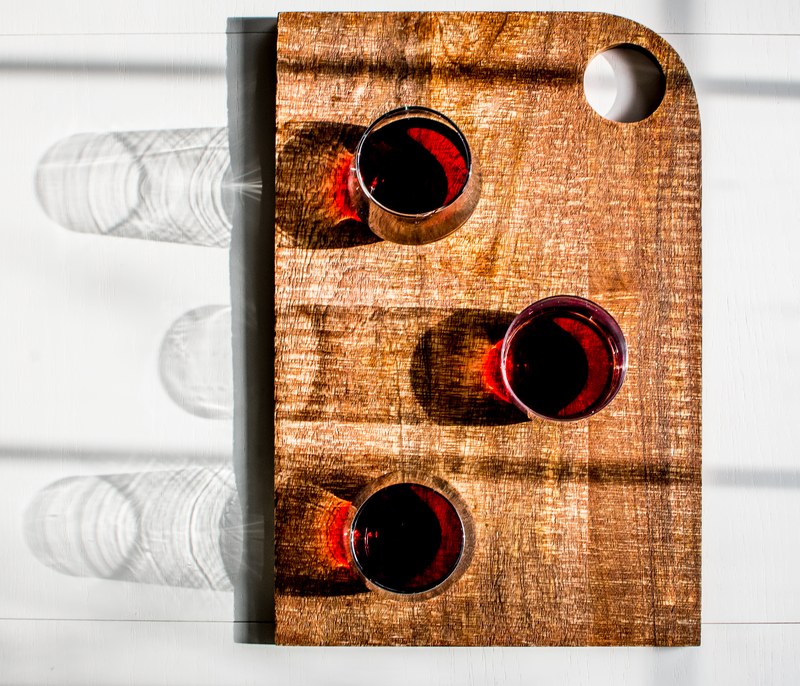 What is served to drink is going to bring out the flavor in each of these items—which is important during these types of dining experiences. The wine needs to be the standout and that’s why I look to Napa Valley and their Cabernets. Napa Valley Cabernet Sauvignons are treasures. 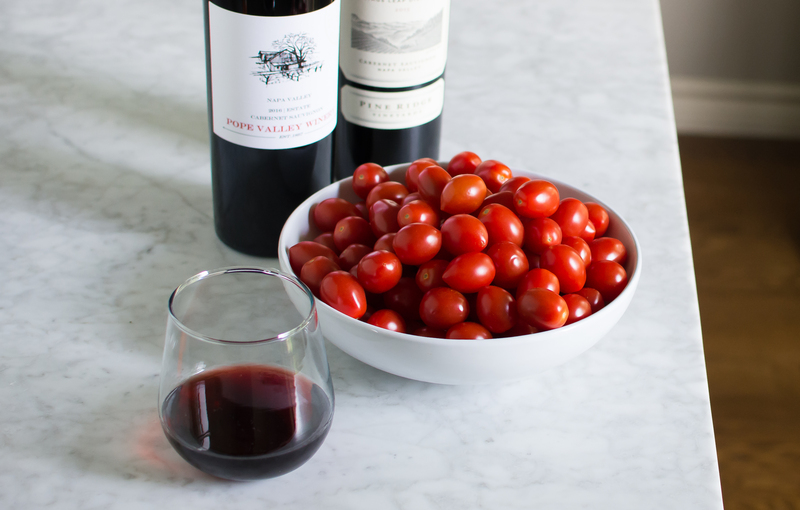 The tastes of these Cabernets are delicate yet bold. They are incredibly memorable because after each bottle is finished, it leaves you wanting more. 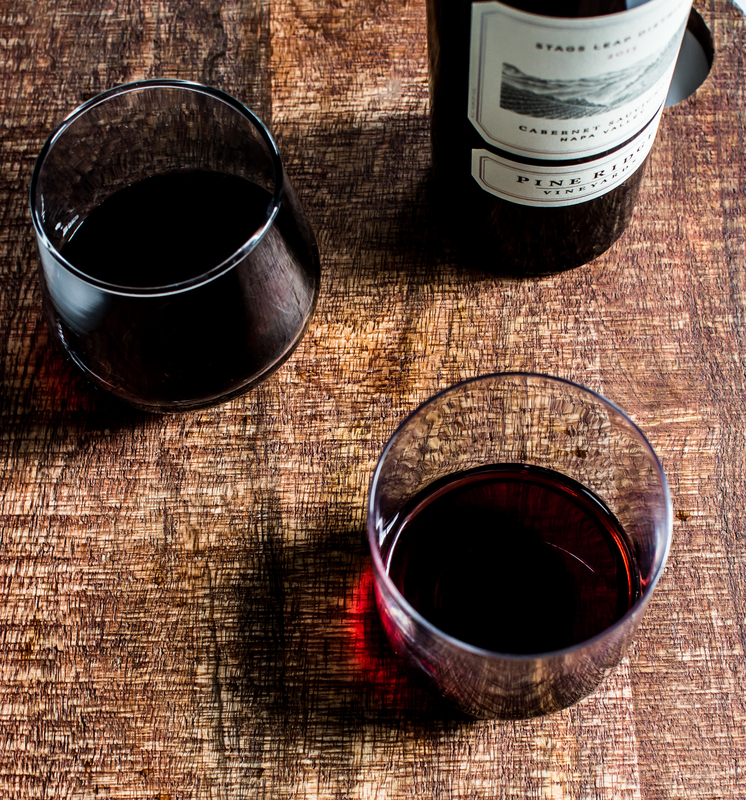 Being a lover of a big Cab, there is always a bottle (or two) of Cabernet waiting to be served on diners like these—winter, spring, summer of fall. 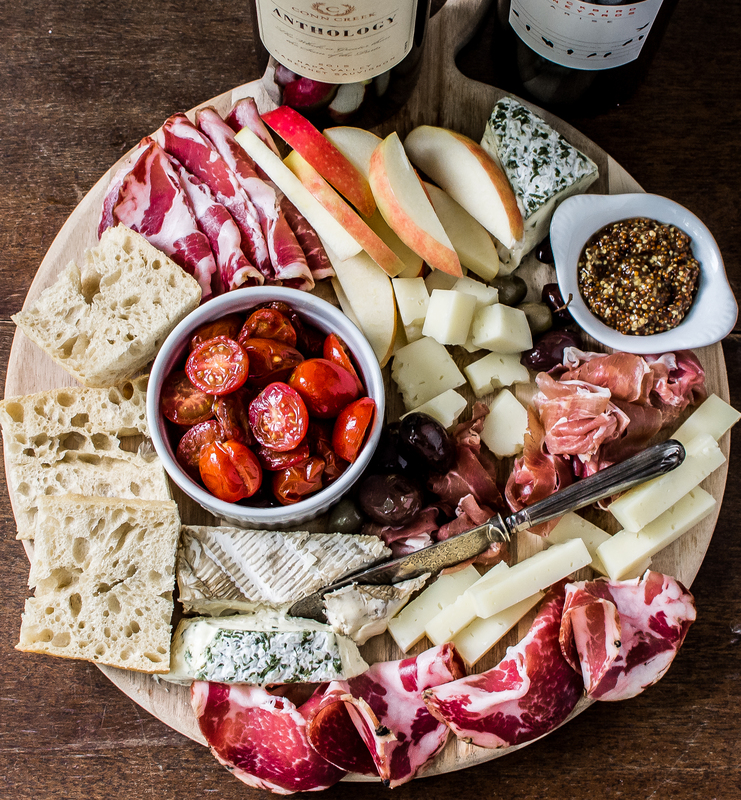 The tannic Cab pairs beautifully with the meats, cheeses and accoutrements. Recently, I had a group of eight friends join me for one of these nights of grazing. The table was filled with three types vessels piled with the odds and ends of a charcuterie and cheese board: meats, cheeses, fruits, vegetables, pickles and condiments. The purpose, of course, was to have a laid-back evening with new and old friends—but it was also to showcase the beauty of grazing. An hour before my guests arrive I open a bottle of Napa Valley Cabernet. A flavorful and full-bodied Napa Cab was needed for this evening. It pairs beautifully with the cured meats, variety of cheeses and the only cooked dish of the evening—smothered tomatoes. You see, not all my guests eat meat. Considering this, I wanted to have a grazing atmosphere but one that did not revolve around salty, cured pork products. In this instance, I serve smothered tomatoes. In this recipe tomatoes are gently simmered in a balsamic vinegar, olive oil, garlic and fresh rosemary mixture. Time and heat produce a concentrated, thickened tomato glory. This tomato condiment is incredibly versatile. It is not only complimentary enough to serve alongside breads and cheeses but it is also hearty enough to serve by itself with an appetizer fork. Plus, it pairs wonderfully with Napa Cabernet. For get-togethers like this, I like to start my guests in the living room—a small station of wine and glasses is waiting to greet my friends. As people begin to arrive, I hand them a glass of wine (which keeps them from wandering to the kitchen) encouraging them to mingle at the front of the house. We circulate around the living room, cozily talking by the fire until all have arrived. Then—we make our way to the food. Set out an hour before arrival time, the meats and cheeses have relaxed to the perfect serving temperature. I remove individual ramekins of smothered tomatoes from a warm oven and place them on individual plates. We all sit back, grab from the boards what looks most tempting at the moment and start our evening. Talking, grazing and sipping. I don’t know how many times I cleaned my plate to go in for more—but I did realize I wasn’t the only one who had this same plan of attack. As the trays were thinned out—and the Napa Valley wine continued to be poured, we were all in a happy state of eating, toasting and conversing the slow evening of good food, wine and relationships. 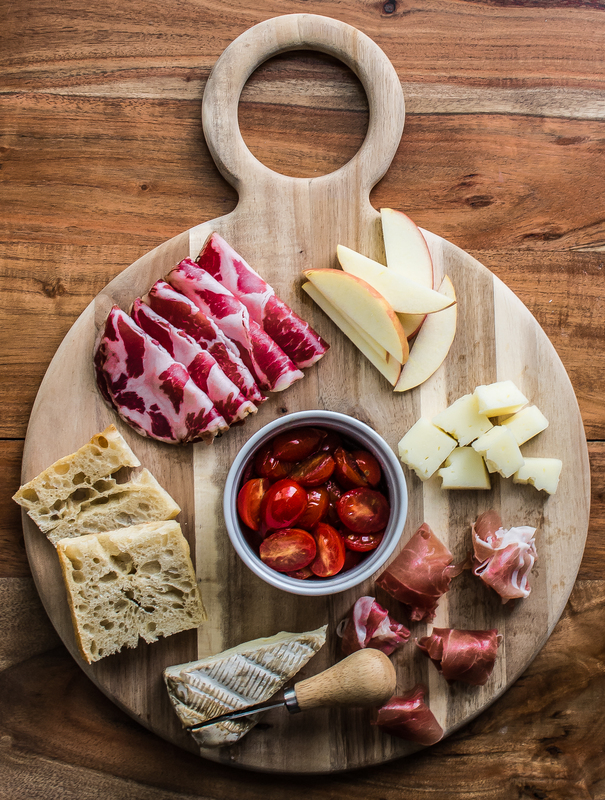 Author note: Here are my preferences for the cured meats and cheeses: prosciutto, salami, capicola, manchego, gruyere, pecorino romano and brie. Place all ingredients onto a wooden board or large platter one hour before serving. Author note: If a hint of pepper is desired, add one green bell pepper, seeded and quartered to the recipe. Place all ingredients into the Instant Pot. Seal the lid and using the bean function cook the beans for 35 minutes. After 30 minutes of cook time turn off the Instant Pot. Set a timer for 15 minutes. Release any remaining pressure after the 15 minutes. Open the Instant Pot and serve the beans in a bowl, topped with pico de gallo and sour cream. My Aunt Linda has a chicken casserole recipe that the entire family has swooned over for decades. Still to this day, when anyone talks of “Amy’s Favorite Chicken Casserole” there’s a collective sigh of longing. I don’t recall when I first ate this scrumptious one pot wonder. It was probably during one of our Tennessee summers that my southern auntie cooked it for everyone. After this first encounter we were smitten and once back home from vacation, my mom began to religiously make it for our dinner table. Another favorite one pan meal of mine is chicken pot pie. The vegetables along with the creamy roux makes my heart go pitter-patter. 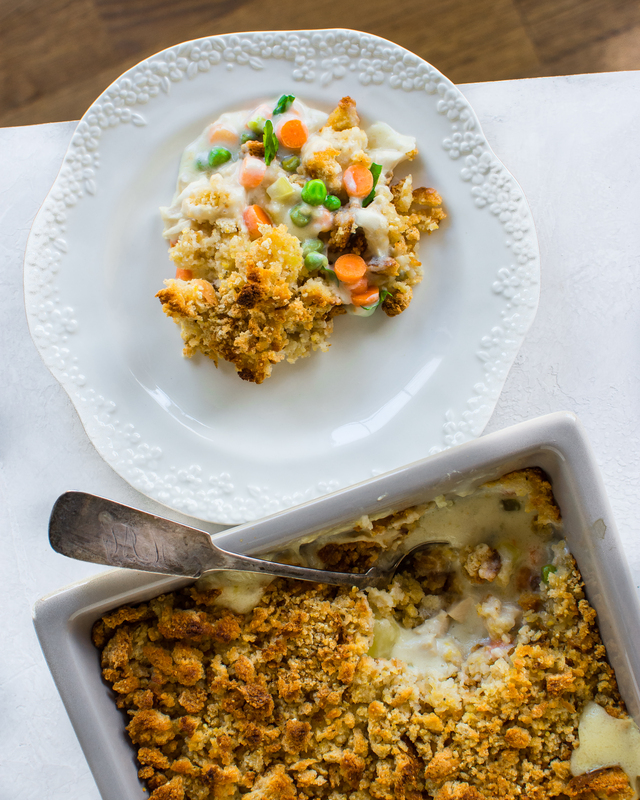 In the perfect world these two casseroles combined would be heaven on earth. Well, heaven on earth is here, folks. 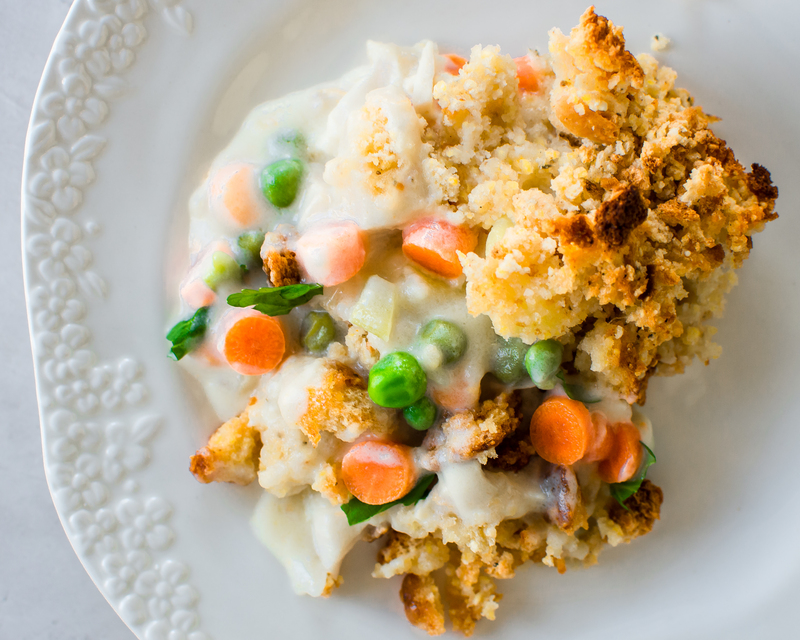 Chicken Pot Pie Casserole is a combination of my dearly loved aunt’s chicken casserole along with my love for chicken pot pie. I couldn’t think of a better time to roll this recipe out than for Easter. 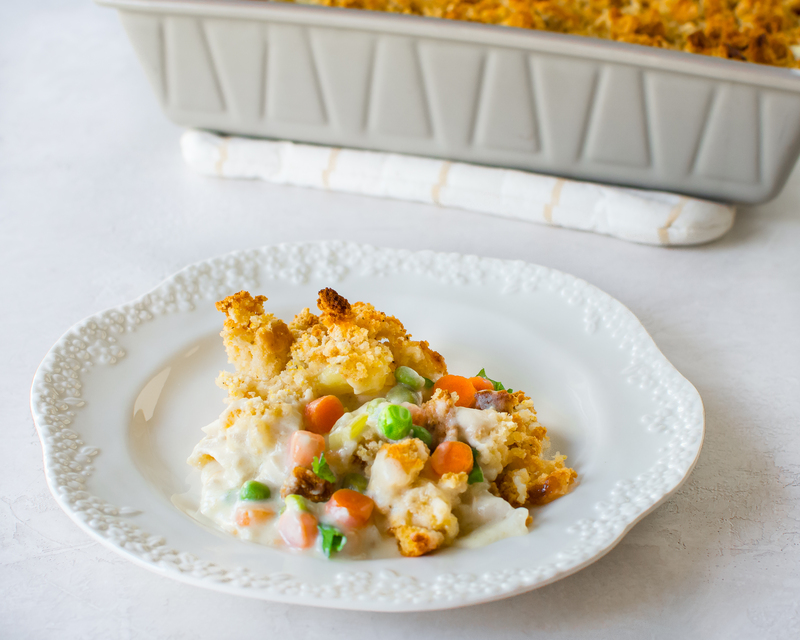 What makes this wonderful for an Easter luncheon is that the casserole can be made two days in advanced (except for the cornbread dressing on top!). Then, once home from church, it can easily be popped into the oven before everyone arrives for lunch. This special casserole is totally Easter friendly but it does need a few other accoutrements to go along with it with it. Freshly baked bread! Deviled eggs! Delicate green salad! All these delicious sides are ready made and ready for you to pick-up at Market Street. While at Market Street shopping for all the Easter luncheon requirements, be sure to grab a new casserole dish for the festivities because the Dish Department ALWAYS has kitchen objects to be desired. 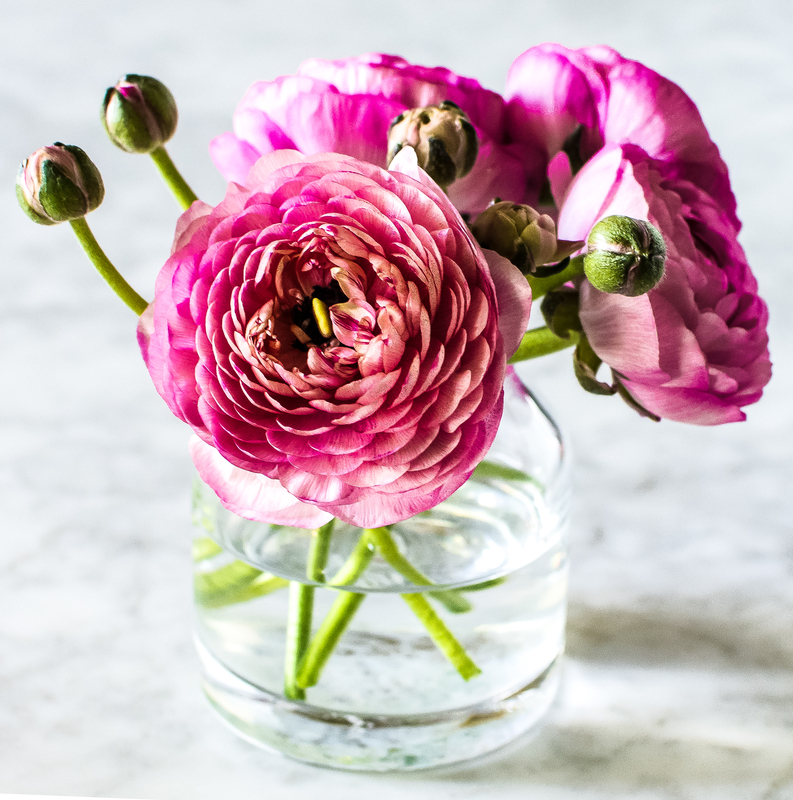 And, since you’ll be collecting a few new fancies, pop over to the floral department and grab some fresh flowers to build your own arrangement (or select a florist designed arrangement) for your Easter table. Market Street is your one-stop shop for all your Easter dining needs. This shop is the perfect combination of fresh ingredients for homemade dishes and well-crafted pre-made goodies to accompany any meal. With Market Street and A Pleasant Little Kitchen by your side, there’s no doubt that your Easter luncheon is going to be a pleasant little gathering. Author note: This recipe can also be made with store-bought rotisserie chicken and store-bought chicken stock. If you use store-bought chicken stock, be sure to use reduced sodium and reduce the amount of salt used in the recipe to 1 1/4 teaspoons. Then salt to taste before baking. Place the chicken and water into a large stock pot. Bring to a boil. 25-30 minutes after boiling, remove the breasts and continue to cook the chicken legs. Remove the meat from the bone and cover with foil. Place the bone and skin back into the pan. Simmer for another 30 minutes, or until there is approximately 5 cups of stock in the pan. Strain the chicken pieces from the stock and set the stock aside for the casserole. Place 4 tablespoons of butter into a large saucepan. Melt over medium heat. Once melted add the butter. Whisk and cook until golden, about 3-4 minutes. Add the onion, celery and carrots. Cook until fragrant and softened, about 2-3 minutes. Slowly whisk in the 3 cups chicken stock and 1 cup whole milk. Whisk until most of the flour clumps are broken up. Bring to a boil. Add the salt and potatoes. Lower the heat and bring to a simmer. Cook until the potatoes are al dente and the sauce is thickened, about 15-20 minutes. Stir occasionally to prevent the sauce from sticking to the pan. Add the peas and sour cream to the mixture. Stir well to incorporate and heat through. Remove from the cooktop and stir in the cut chicken. 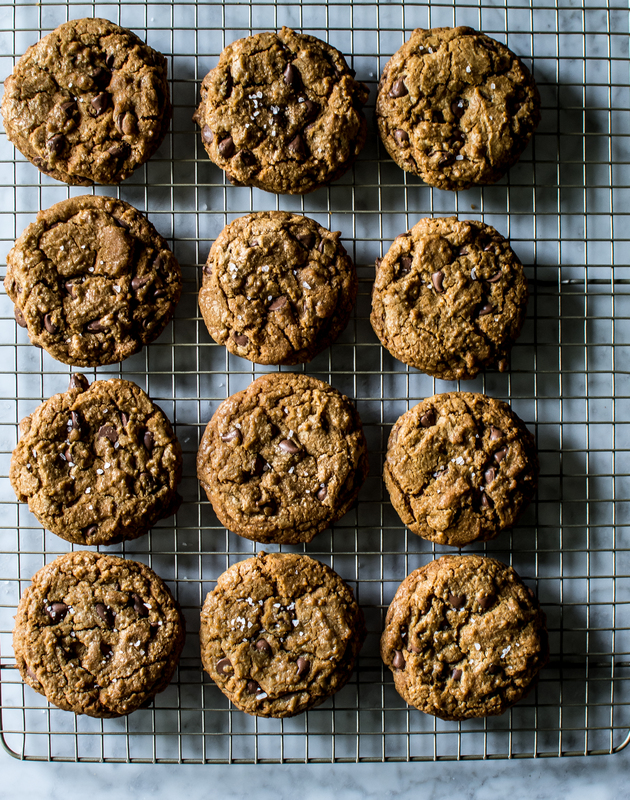 Pour the ingredients into a large baking pan. Evenly top with instant stuffing (you may not have to use the whole bag), 1 cup chicken stock and melted butter. Bake for 30-35 minutes or until the top is golden brown. Remove from the oven and let cool for 10 minutes. Serve warm. Author note: The basic tomato sauce is slightly tweaked version of Marcella Hazan’s Basic Tomato Sauce. Store bought tomato sauce also works for this recipe. Place the puff pastry on a cutting board (unwrapped and unfolded). 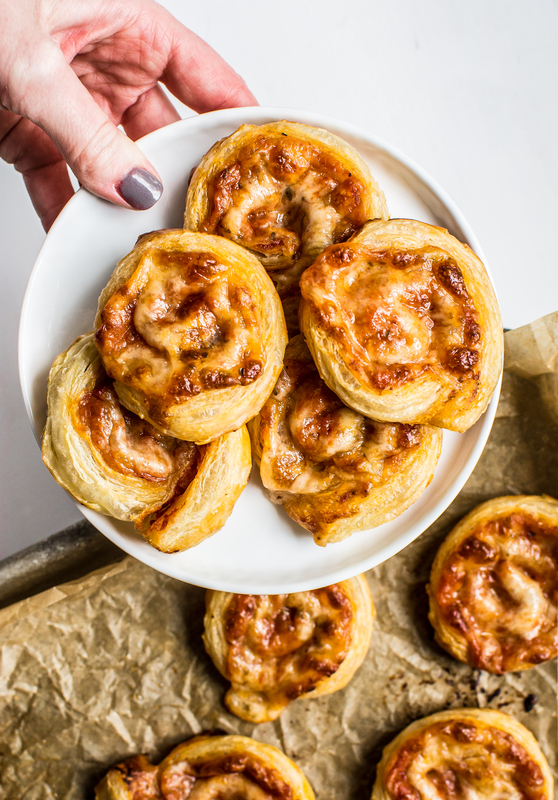 Evenly distribute one layer of tomato sauce on top of the pastry. Add a layer of cheese and any other topping you would like. Lightly dust the top with dried oregano. Starting with one end, tightly roll-up the dough (like a jelly roll). Once tightly rolled make sure the seam is facing down. Crack the egg into a small bowl and whisk. Using a pastry brush, brush the top and sides of the pizza roll with the egg wash. Slice into 1/2 inch pieces and place onto a parchment lined baking sheet. Place into the oven and bake for 20 minutes. Remove from the oven and serve warm. Place all ingredients into a saucepan. Bring to a simmer and cook for 45 minutes. Remove the onion. Salt to taste. Use on pizza or pasta. Author note: If you are pressed for time do not make the onion butter. Use unsalted butter. Also chop up 1/2 a shallot and throw it into the shrimp mixture. In a large bowl, combine the onion butter, salt, lemon zest, 1 tablespoon olive oil and garlic. Stir well. Add shrimp and asparagus to the mixture and stir well to combine. 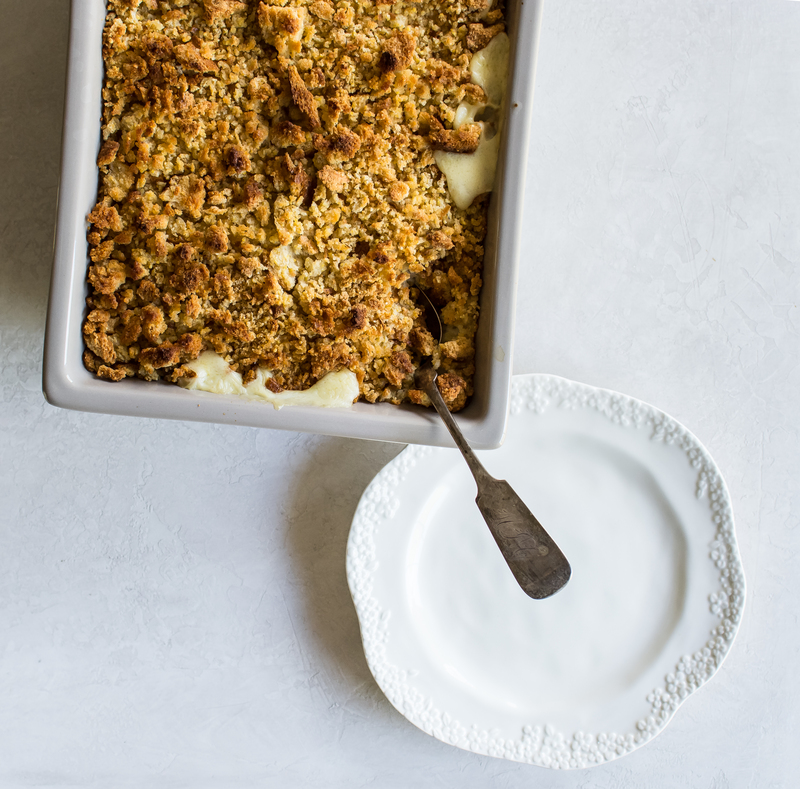 In a small bowl, toss breadcrumbs with 1 tablespoon extra-virgin olive oil. 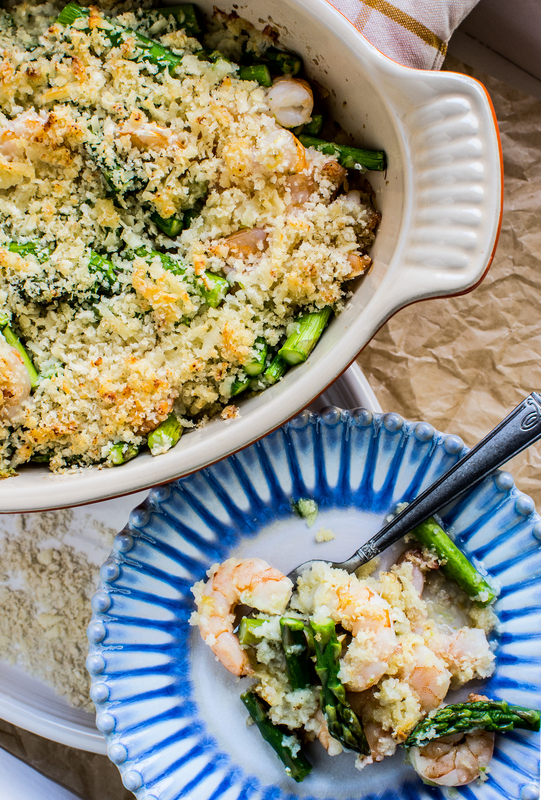 Place shrimp mixture into a large gratin dish (or a shallow glass baking dish). Add the white wine and then top with breadcrumbs and parmesan cheese. Bake 15-20 minutes or until the shrimp is cooked and the top is browned. Place onions in food processor. Puree. Add butter. Puree until combined. Scrape sides of bowl as needed. Store in airtight container or plastic wrap in the fridge for up to one week. Place the shallot, basil, parsley and 1 tablespoon olive oil into a food processor. Blend until a paste-like consistency develops. 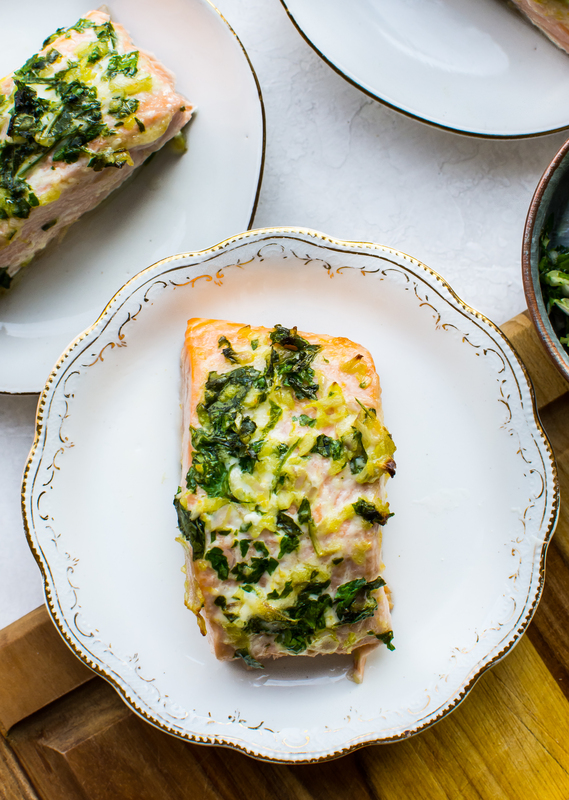 Remove the salmon from the fridge and place on a foil-lined rimmed sheet pan. Evenly distribute 1/2 teaspoon salt and lemon zest on the salmon fillets. Add a layer of mayonnaise on each fillet. Then top with the herb mixture. Let sit at room temperature for 30 minutes. Heat oven to 425 degrees. Place the salmon into the oven and bake for 12-15 minutes or until the salmon reaches 145 degrees. Remove from the heat, top with fresh lemon juice and serve warm.